Providing you the best range of hospital curtains and anti microbial curtain with effective & timely delivery. Offers the best selection of high-quality privacy, cubicle and hospital curtains for all of your applications that require privacy and seclusion. Privacy curtains are commonly used in the medical and commercial industries where they serve as hospital privacy curtains, doctor's office privacy curtains, dressing room curtains and even to give privacy to cubicles in offices. The curtain fabrics we offer combine safety, style, ease of care and affordability. The construction of these privacy curtains ensures the look that is desired coupled with long curtain life, resulting in value for the customer. 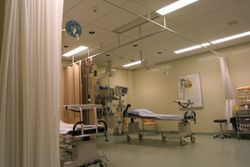 While these curtains are commonly used in hospitals, clinics and other medical facilities, they offer function and fashion for a wide array of applications. They can be made with or without the mesh at the top, depending on your specific needs and fire code requirements. We also offer curtain tracks for privacy and hospital curtains. All cubicle curtains are fabricated using fabrics that pass NFPA 701 testing, the most stringent national standard. Please consider all local codes, however, to ensure you meet all requirements (e.g. some areas require the use of drops in lieu of mesh to ensure appropriate coverage of sprinkler systems. Most fire codes require the use of mesh across at least the top 20 inches of a privacy curtain. Our curtains feature half-inch flame retardant mesh which meets NFPA requirements. Mesh available in 11 colors, although white or ivory are the most common choices to compliment fabric selection. Curtains can be made solid, without mesh as well. Height: Curtains available in any height, so identify the preferred spacing between the bottom of the curtain and the floor. Hardware drops the curtain by approximately 3 inches. Width: Curtains available in 18-inch increments. Add at least 10% (15% for tracks under 9 feet) to a length of track to account for fullness. Be sure to include ceiling height and track length and layout when requesting a quote. A wide range of flame retardant fabrics is available for use in fabricating privacy cubicle curtains. We offer several of the most popular options below for your consideration. If you require a specific fabric, please contact us so that we may verify the fabric availability and lead time. All fabrics are "true-light" tested to ensure that the opacity of the fabric provides absolute privacy. Selection of fabrics shown typically ensures shorter lead times of one to three weeks from order placement to shipment.